Seawater leak detection is one of the post-condensation water quality management processes that are performed for power station boilers and similar facilities. Damage to the ion exchange resin, which deionizes the supplied water, is also monitored during this process, and both of these applications are executed by a conductivity analyzer. 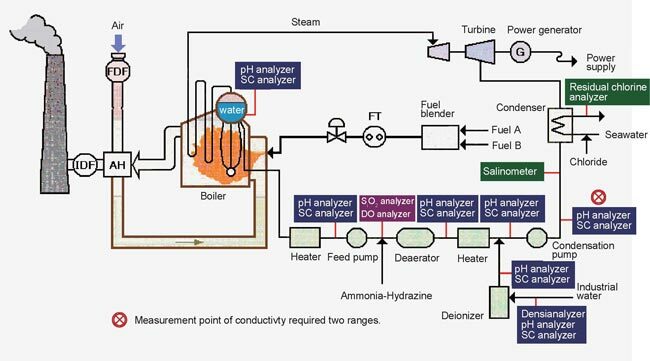 The above illustration shows where analyzers are used in the boiler water quality management process. In the measurement point shown in the figure, two different signal ranges are needed for deionized water management and seawater leak detection. The SC450 can simultaneously generate output signals for two different ranges, meaning that a single unit can perform deionized water management concurrently with seawater leak detection. Other applications for this conductivity analyzer include the management of deionized boiler water.